Malaysia Airline (MAS) is cutting capacity to Australia by over 40% in Aug-2015 as it drops Brisbane and reduces capacity to Adelaide, Melbourne, Perth and Sydney. But Australia remains an important market for MAS and the flag carrier will remain one of Australia’s 10 largest foreign airlines. The reductions are sensible as for the most part they simply reverse earlier expansion that was overambitious and unsustainable. MAS does risk leaving an opening for competitors, particularly Malaysian rival AirAsia X, but in the current challenging phase of its history it cannot be worried about market share. This is Part 1 in a series of reports on MAS capacity cuts and the potential impact on the Malaysian and broader Asian markets. This report focuses on Australia, where the upcoming MAS cuts follow significant capacity reductions made in early 2015 by AirAsia X. New Malaysia Airlines CEO Christoph Mueller will be participating in a panel discussion on the outlook of the Australian international market at the CAPA Australia Pacific Aviation Summit on 4-Aug-2015. For more information on the Summit and the full agenda, click here. MAS currently operates 73 weekly passenger flights to Australia, including 21 frequencies to Melbourne and Sydney, 14 to Perth, seven to Adelaide and Brisbane and three to Darwin. Brisbane is being dropped entirely on 8-Aug-2015 and at about the same time MAS is cutting seven Melbourne and Sydney frequencies, six Perth frequencies and three Adelaide frequencies. Darwin will be maintained at the current three weekly flights but was already cut from four frequencies in Apr-2015. Kuala Lumpur-Darwin and Kota Kinbalu-Perth are operated with 737-800s. All of MAS’ other flights to Australia are currently operated with A330-300s except one of the three daily flights to Melbourne which is operated with 777s. MAS will drop the 777 flight, leaving it with entirely A330-300s on four Australian routes (Kuala Lumpur to Adelaide, Melbourne, Perth and Sydney) while the 737-800 will continue to be used on Kuala Lumpur-Darwin and Kota Kinabalu-Perth. Kota Kinabalu-Perth is the only Australia route that does not originate at MAS’ main hub in Kuala Lumpur. MAS now serves Perth with 12 weekly A330 flights from Kuala Lumpur and two weekly 737-800 flights from Kota Kinablua. Kuala Lumpur-Perth is being cut to seven weekly flights and Kota Kinabalu-Perth to only one weekly flight. As of mid Aug-2015 the new MAS schedule will include 43 weekly flights to Australia, including 14 to Melbourne and Sydney, eight to Perth, four to Adelaide and three to Darwin. The approximately 11,700 one-way seats generated by the 43 flights represents a 42% reduction in capacity compared to the approximately 20,000 one-way seats currently provided, according to CAPA and OAG data. ASKs between Malaysia and Australia will also be reduced by 42% to about 136 million per week. MAS has provided about 20,000 weekly one-way seats to Australia since the end of 2013, when it pursued what proved to be overly ambitious expansion in the Australian market as it added third daily frequencies to Melbourne and Sydney. MAS also launched Darwin in late Oct-2013 and at about the same time increased Kuala Lumpur-Perth from 10 to 12 weekly flights. Kuala Lumpur-Brisbane was increased from five to seven weekly flights in Jun-2013 while Adelaide was upgraded from six to seven weekly flights in Oct-2012. MAS is essentially now rolling back the Melbourne and Sydney increases, reverting to 2013 capacity levels on the core Kuala Lumpur-Melbourne and Kuala Lumpur-Sydney routes. The cuts at Adelaide and Perth bring it even below 2012 levels to these destinations by about 600 and 800 weekly one-way seats respectively. The suspension of Brisbane has the biggest impact as it removes almost 2,000 weekly one-way seats. Overall MAS capacity to Australia in Sep-2015 will be about 19% below Sep-2013 levels. MAS is currently the fourth largest foreign carrier in Australia. 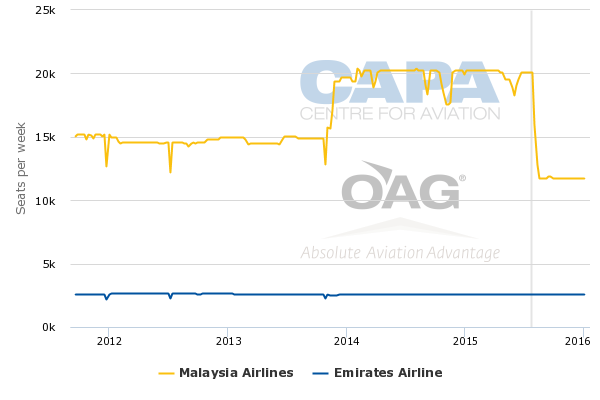 Emirates is the largest foreign carrier in Australia and also has one daily flight in the Australia-Malaysia market (captured in the above chart). Singapore Airlines is second largest followed by Air New Zealand. The upcoming cuts will see MAS slip four places as it is overtaken by Cathay Pacific, Etihad Airways, Thai Airways and its Malaysian rival, AirAsia X. China Southern will also overtake MAS in late 2015 as it pursues expansion in Australia, leaving MAS then as the ninth largest foreign carrier in the Australian market. 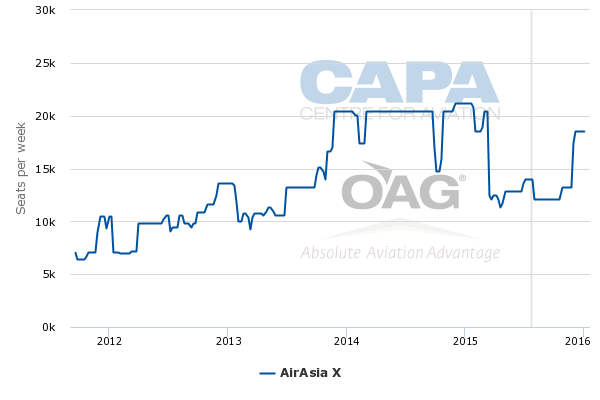 As CAPA previously highlighted, Air Asia X implemented its own capacity cuts to Australia in 1Q2015. Sydney was cut from 14 to seven weekly flights, Melbourne from 14 to 12 weekly flights, Perth from 14 to 11 weekly flights and Gold Coast from seven to five weekly flights. Adelaide, which had been served with five to seven weekly flights, was cut entirely in Jan-2015. The cuts at AirAsia X also essentially reversed increases from 2013, when the long-haul LCC added a second daily flight to Melbourne, Sydney and Perth, upgraded Gold Coast to daily and launched Adelaide. With the expansion AirAsia X briefly overtook MAS as the largest airline in the Malaysia-Australia market. MAS regained this status in early 2014 after adding a third daily flight to Melbourne and Perth. AirAsia X’s Aug-2015 schedule includes 32 weekly flights to Australia and about 12,000 weekly one-way seats. This is enough capacity to put it back ahead of MAS from mid-Aug-2015 but initially only by a hair as MAS cuts back to about 11,700 weekly seats. AirAsia X however is planning to add back capacity to Australia in Dec-2015. Its current schedule for Dec-2015 includes 49 weekly flights to Australia as double daily flights to Melbourne, Perth and Sydney are resumed while Gold Coast is again served daily. AirAsia X will offer about 18,500 weekly one-way seats to Australia in Dec-2015, which is still a 12% reduction compared to Dec-2014 as the airline is not planning to resume service to Adelaide. AirAsia X’s resumption of double daily flights to Melbourne, Perth and Sydney was planned long before MAS informed in Jun-2015 its Australian airports and other partners of its plans to axe Brisbane and reduce capacity to Melbourne, Perth and Sydney. AirAsia Group CEO Tony Fernandes first indicated at a Mar-2015 media event in Sydney that AirAsia X would resume double daily flights to Melbourne, Perth and Sydney in late 2015 and was also considering re-launching Adelaide. The cuts at MAS however could persuade AirAsia X to maintain 49 weekly flights to Australia on a year-round basis – or at least operate significantly more than its current off-peak schedule. For now the AirAsia booking engine shows AirAsia X reverting to an Australia schedule of 35 weekly flights in Feb-2015, including 12 to Melbourne, 11 to Perth, seven to Sydney and five to Gold Coast. AirAsia X anticipated for several months that MAS would cut capacity to Australia before deciding in Nov-2014 to make a move first, hoping MAS would follow. MAS was extremely slow in cutting capacity to Australia – as well as in other markets – after initially unveiling a recovery plan in late Aug-2014 . The capacity levels between Australia and Malaysia that resulted after the two countries expanded their air services agreement in 2013 was clearly unsustainable. Even without any financial problems at AirAsia X and MAS it would have been difficult for the two airlines to maintain a combined 129 weekly flights to Australia, including a combined five daily flights in the Melbourne and Sydney markets. At the prior capacity level MAS and AirAsia X had to rely significantly more on connecting traffic beyond Kuala Lumpur, particularly during the off peak periods for local Malaysia-Australia demand. The fares offered over the last year two years to attract one-stop passengers were generally below cost. This was a reflection in part of the overcapacity between Malaysia and Australia but also the overcapacity in the broader Australia-Asia market. The condition was made worse as the Australian dollar began its slide against the USD - and many Asian currencies. The AUD vs USD stands over 20% below levels of even Jul-2014. Several other Southeast Asian carriers pursued expansion in Australia at about the same time as AirAsia X and MAS. In Aug-2014 there were about 170,000 weekly one-way non-stop seats from Australia to Southeast Asia, representing an increase of about 10% compared to Aug-2012, despite significant cuts in 2013 from Qantas. In Aug-2015 Australia-Southeast Asia capacity will be back to Aug-2012 levels of approximately 155,000 weekly one-way seats. AirAsia X and MAS are not the only carriers to respond to the overcapacity situation. Over the last year Garuda has cut capacity to Australia by about 15% while Singapore Airlines (SIA) has made a smaller 4% adjustment, according to CAPA and OAG data. While overall the Australia-Southeast Asia market now has a more rational level of capacity competition remains intense and overcapacity concerns linger on some routes. 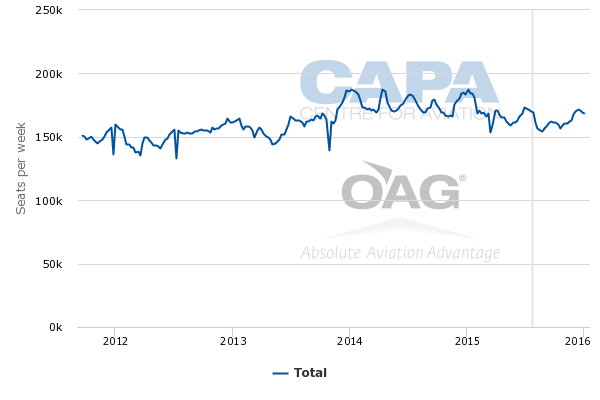 There is also a risk that capacity may be added back too quickly as airlines look to again pursue strategic expansion. Scoot for example has restored capacity on its three Australia routes after cutting back in 2014 and is launching in Nov-2015 a fourth destination in Australia, Melbourne. In Nov-2015 Scoot’s Australia capacity will be up by about 60% compared to Nov-2014. Cebu Pacific and Philippine Airlines (PAL) are also now seeking entitlements to add capacity to Australia following a recently concluded new air services agreement between Australia and the Philippines. Seat capacity has already doubled between Australia and the Philippines over the last year, driven by Cebu’s launch of services to Sydney in Sep-2014 and expansion from PAL. While Australia-Philippines is still relatively under-served compared to other Australia-Southeast Asian markets it may not be able to absorb another surge of additional capacity. Philippine carriers will likely have to start competing more aggressively for transit traffic beyond Manila, which will further intensify competition in the broader Australia-Southeast Asia and Australia-Northeast Asia markets. Australia-Northeast Asia has not seen the same kind of capacity increases as Australia-Southeast Asia over the last few years but will see a surge in 4Q2015 driven by new services from Chinese and Japanese carriers. This will impact Southeast Asian carriers such as AirAsia X which have increased their reliance on North Asia source markets to support their expanded Australian operations. AirAsia X’s reliance on one-stop traffic to North Asia could increase further as the group resumes expansion in Australia. In addition to adding back some capacity from Kuala Lumpur, AirAsia X is planning to launch routes from Bali to Brisbane and Sydney and from Bangkok to Sydney using its new affiliates in Indonesia and Thailand. Indonesia AirAsia X already serves Melbourne from its Bali base while short-haul sister carrier Indonesia AirAsia serves Darwin and Perth from Bali. There will also be opportunities for AirAsia X’s Malaysian subsidiary to expand beyond two daily flights in the Melbourne, Perth and Sydney markets as MAS will no longer be using all of its capacity entitlements to Australia. Lion Group Malaysian-based affiliate could also end up operating some of these traffic rights as it has previously expressed interest in serving the Kuala Lumpur-Perth route, which is within range of its 737 fleet. Both AirAsia X and MAS quickly snapped up all the additional entitlements made possible by the expanded bilateral Malaysia forged with Australia in 2013. The new agreement provided a 50% capacity increase across the four markets that are capped – Brisbane, Melbourne, Perth and Sydney. Other Australian gateways including Adelaide, Darwin and Gold Coast do not have any capacity restrictions. AirAsia X could launch Brisbane to supplement its Gold Coast service, particularly as its Indonesian affiliate is targeting Brisbane rather than Gold Coast for services from Bali. MAS’ decision to cut Brisbane entirely was somewhat of a surprise as Brisbane has traditionally been a good market for Southeast Asian carriers including SIA. There could also be potential opening for Emirates, which already serves Melbourne from Kuala Lumpur and now serves Brisbane (as well as Melbourne) from Singapore. MAS’ decision to cut capacity to Australia by over 40% seems harsh, particularly as is cutting overall international capacity by only approximately 20% as part of its restructuring. But the picture changes when placed in the context of the capacity that was added by MAS in Australia less than two years ago and the overall overcapacity in the Australia-Southeast Asia market. MAS also needed to take into account the impact from the restructuring of its overall network as it reviewed options for Australia. For example suspension of services to Frankfurt and Istanbul leaves the carrier as a significantly smaller player in the Australia-Europe market. MAS will still be able to maintain a significant presence in the Melbourne, Perth and Sydney markets with two daily flights. The third frequencies to Melbourne and Sydney, which did not open up a large number of new city pairs, were never necessary. Withdrawing from Brisbane is a bigger blow as MAS had been serving the Queensland capital for over two decades. Reducing Adelaide to less than daily is also disappointing to South Australia, particularly as it comes after AirAsia X pulled out. But overall MAS will still be able to maintain a relatively strong position in the Australian market. Australia remains an important market for the Malaysian flag carrier and will still account for more than 9% of its international seats and about 16% of its international ASKs after the upcoming cuts. MAS has little choice at this point but to reduce capacity to Australia and hope they will help drive up yields to more sustainable levels. Market share is no longer the name of the game. MAS can no longer afford to be the fourth largest foreign carrier in Australia – or the largest carrier in the Australia-Malaysia market – simply for the sake of prestige. The changes make a sound statement in the direction of a much more rational commercial approach.